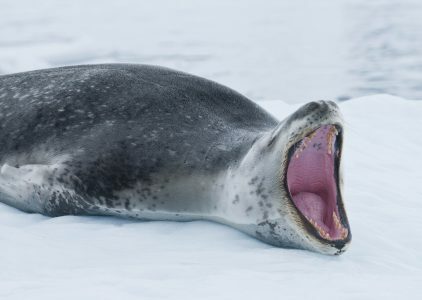 On this departure to Antarctica, extended hikes, snowshoeing, enhanced photography excursions, overnight sea kayaking and ski touring are all possible to combine on one voyage. 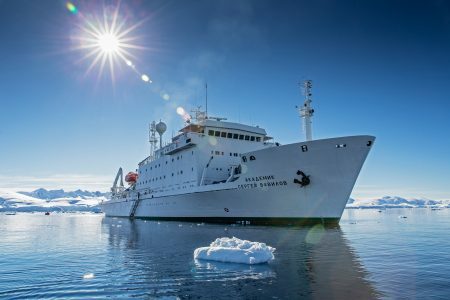 Passengers benefit from the expedition ship being used as a mobile base camp wilderness lodge to discover the white continent at your own pace! 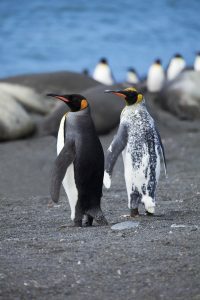 Travelling on a true small expedition ship with high ice rating unlocks great wildlife sightings, because Chinstrap, Gentoo and Adelie penguin colonies, whales, seals and sea birds return to the plentiful feeding grounds of the Antarctic peninsula. We awaken today and the magnificent snowy peaks of Antarctica are laid out before us. Over the next week, our itinerary is intentionally flexible to account for early season ice conditions and to take advantage of optimal snow conditions. 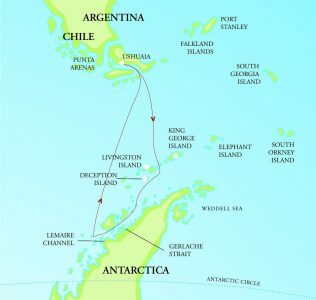 Our planned exploration starts in vicinity of Mikkelson Harbour and neighbouring Cierva Cove – both beautiful locations and the perfect introduction to Antarctica. Our days are spent exploring on and off the ship in the company of our expert guides. Popular activities include guided hikes on shore, visits to wildlife colonies, and exploration of historic huts and science stations. Zodiac cruising in the ice is always a thrill. Based on site conditions, the ski touring group may set off to explore the pristine terrain with our experienced mountaineering guides. The expedition snow-shoe group may follow in the tracks of the skiers, climbing to high points which afford breathtaking views. The sea kayakers will head out on excursions which may last all day. Photography enthusiasts will enjoy the chance to spend an entire day with our expedition photographer on an all-day field workshop. Everyone aboard will have an opportunity to camp onshore for the night in Antarctica if the weather cooperates. In the comfort and safety of our expedition ship, we range as far south as ice conditions permit; hopefully, we are able to navigate to Neko Harbour and into the Errera Channel. Witnessing the migration of the Penguins early in the season, as they busily re-establish their rookeries and prepare nests, is a fascinating experience. Cuverville Island is always a highlight and is home to one of the largest gentoo penguin colonies on this stretch of coastline. The adventure is not over and we plan an additional day of exploration in the South Shetland Islands. In the evening, we navigate into the Drake Passage, charting a course for South America.